Data collection and analysis at Machine Learning scale: Every new Tesla currently driving thousands of the miles on the road is gaining knowledge of how to autonomously navigate our human infested roads. With every additional mile driven by each car, more collective knowledge is gained and dumped in a central database where it is analyzed in real-time using machine learning. Tesla’s swarm of cars is enabling even more simulations of what driving in real life looks like. Instead of writing rules for the vehicle to follow, the system can use ML to make decisions based on the reams of data that it has been trained on. Edge cases that are actually the norm (Brains): Training a self driving car is possible in the US because there are enforceable and encoded rules and regulations that govern the road. While these rules might be broken, leading to accidents etc, for the most part we are conditioned to follow the rules of the road. And you can train your software to follow those rules. But this is not the case in places like Nigeria where there are no rules or consequences for breaking the few rules that exist; you need huge numbers of simulation to cater to the possibilities. The simulation requirements are further complicated by the lack of structured roads; paths become roads and fall back into being paths before you’ve had time to update your database/Carcraft. 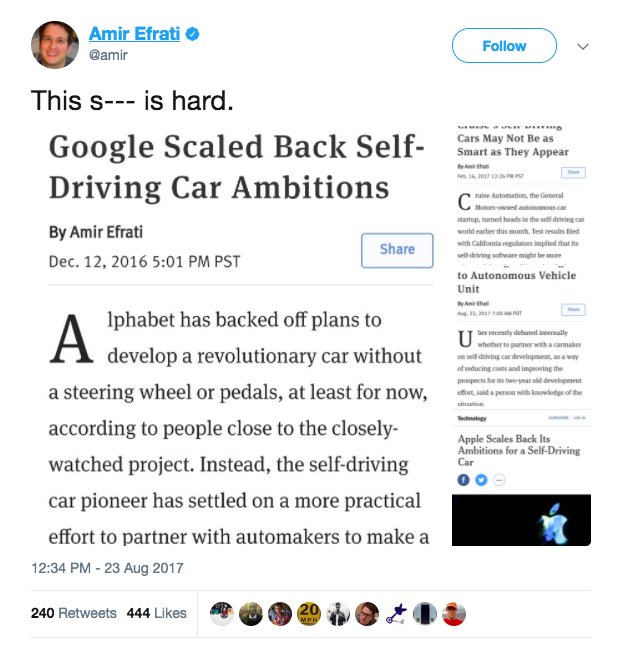 Technological challenges (Brains and Body): continuing the point above, the technological complexity of a world without rules is one that will test the limits of self-driving car capabilities. Redundant mechanical systems have to be built into the cars to ensure that the car responds adequately when these edge-but-normal cases happen. It is not about the cars, per se, it’s about the rest of us. We are truly unpredictable . Technology is not advanced enough to capture the context and mind state of a driver in another car. The time between now and when all the other cars on the road are self-driving will be an interesting one. Next articleWho Leads the Autonomous Driving Patent Race?